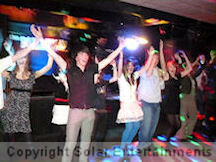 Solar Entertainments provide professional, top quality mobile disco and DJ hire services for Private Parties, Corporate Events and Weddings. We have a huge amount of experience providing disco hire to mixed functions of all kinds including birthdays, children's parties, engagements, weddings, civil partnerships, corporate events, theme nights, Christmas and New Year parties. 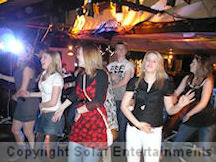 Below you will find some of the key benefits you can expect when booking our disco and DJ hire services. When booking our disco and DJ hire services you can expect our utmost attention to your requirements and event details from your initial enquiry to event completion. No two customers, events or audiences are ever the same so we tailor our disco hire services and performances accordingly. Simply tell us your event details and we will help in any way we can. We work extremely hard both before and during your event to ensure we provide you with great entertainment suitable for yourself, your guests and your venue. We pride ourselves on providing a professional level of customer service at all times. We will work closely with you from your initial enquiry to the end of your event to ensure all your requirements are met. All details and arrangements for your event are confirmed in a written contract upon booking. Contracts are updated if any arrangements change. We use state-of-the-art administrative systems to keep track of all our enquiries, bookings, clients, messages and payment information. This ensures your information is held safely, securely and is accessible to us whenever and wherever we might need it. We offer a variety of payment methods including cheque, bank transfer, Paypal and online credit card payments to make transactions as easy as possible. Artistes will arrive at your venue at the agreed time to setup all necessary equipment. They will be dressed appropriately for your event and will be courteous and professional in all aspects of their work. As members of the National Association of Disc Jockeys, Alliance of Mobile & Party DJs and holders of a highest Diamond DJMark award, we meet their code of conduct and provide a professional, top quality service from initial enquiry through to event completion. All equipment is electrically PAT tested annually for safety and artistes covered by Public Liability Insurance for your peace of mind. Appropriate certification will be carried for presentation to your venue if they require it, or this can be forwarded beforehand. We also carry Produb certificaton of our digital music transfer licence. Please see the links on the left-hand side of our website for more details on these important areas. We carry music from all popular genres suitable for mixed functions including Pop, Rock, R&B, Indie, Dance, Disco, Rock & Roll, Party, Swing, Motown, Soul, Latin/Salsa, Reggae, Children's songs, Film Themes, Musicals, Irish, Scottish, Ballroom (Waltz, Cha Cha, Jive etc), Classical and of course music for birthdays, Christmas, New Year, Halloween etc. Our music collection spans all eras from the 1950s through to the latest chart releases and is always kept up-to-date. We always confirm our customers' music preferences and any specific requests well in advance of our events to ensure we meet our customers' expectations. Music playlists are welcone as are requests at any time during the event. We are also happy to connect any of your or your guests MP3 players, smartphones or other such devices to our sound system should you or your guests request it. In our industry there is no substitute for experience. Providing disco hire for mixed functions is as much about people skills and reading and communicating with audiences as it is about the actual music itself. We have been providing professional disco hire to all kinds of events since 1998 and in that time have gained a huge amount of experience. We can use this experience to help you plan your event and to ensure your entertainment goes according to plan and that everybody has a great time. All equipment used is modern and of high professional quality to ensure superb audio and visual performance and reliability. We have a range of equipment to adapt our setup for different venues and events. We can provide compact setups for smaller parties and stage filling setups for larger events up to around two hundred people. Backup equipment is carried to cover the vast majority of possible equipment failures, however unlikely they may be. 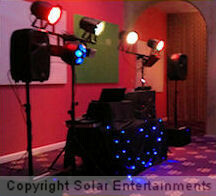 Professional lighting is provided as standard with our disco hire services. Lighting appropriate to your event and venue will be provided and will consist of a combination of the latest LED lighting, halogen lighting, lasers, starcloths and uplighting. Smoke and haze machines are available where venues permit but are only provided upon request.